I live for catfights. They are petty to the ground. Women strip themselves of clothes, wigs, fake nails and every spare part you can think of. It is only a woman who will take off a wig and face her rival “man to man”. They are fierce, carry an armoury of insults and trust me, some of the most intense fights are hosted at your mizigo. In fact, your favourite WCWs do not wear shades for fashion, but to disguise facial stamps from these ghetto power struggles. Fights are governed on “Pick and play” basis. That means, you will pick whatever is in sight to ‘finish’ your enemy, buckets and home appliances are highly recommended. Dare to bring a man between two women, and you are sure to have World War Z. Those are chicks for you. For some of us the idle youth, this is our cup of tea. 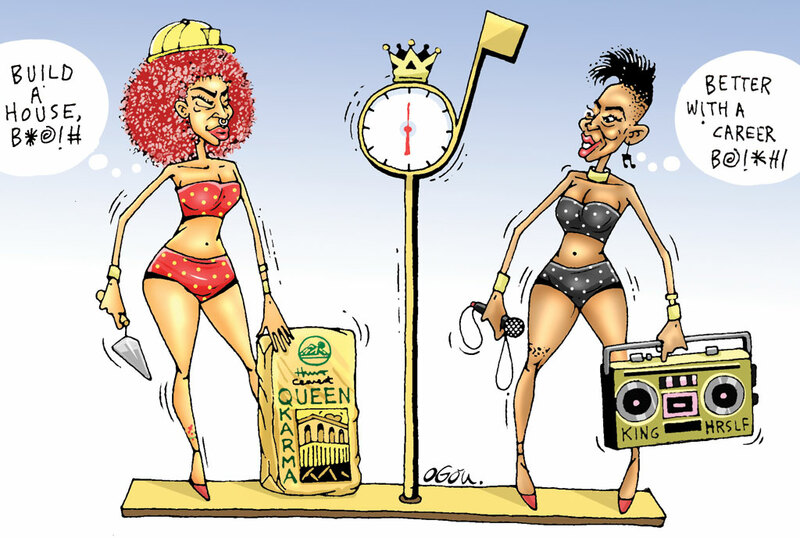 While everyone was busy with nation-building, singer Cindy called out Sheebah for her ‘myeh’ live performances and challenged her to a battle banange. Imagine the disappointment when I found out, it was not a physical battle. Cindy is built powerfully, like a stallion you would imagine. Maybe that is why she is the self-proclaimed ‘King Herself’. For long, she stomped on stages with ferocity, left a huge impression while at it. Idiotic me has always imagined how ruthless she would be in a physical girl fight, kicks galore! She is probably the girlfriend who should never catch you cheating. My Gaaad! Cindy wants a civil fight, with a microphone and a stage against Sheebah, who has mashed us with hits for as long as anyone can remember. Is it balanced? Well, Cindy, although relatively quiet musically, is one of the few artistes in Uganda who actually understand what live performances are about. She will split her body into half, swing her wigs in militant fashion, drain in sweat, all this with a microphone in hand. If you have watched her perform with her band, it is some sensational stuff. We can forgive her for the fact that most songs she performs were done when some of y’all were still in diapers. Battling her is a lot of work. Acrobatics aside, she can sing. Really sing! She can be melodic and go hard like she did on some all-time favourites like Run The City, Party, One and Only. An artiste who can sing, write and perform live is a rare commodity. About who would be a better bet, is a tricky one. I feel like Cindy has matured musically even without recognisable hits in the recent past. Cindy will floor anyone on her day. Cue Queen Karma and you have the most prolific musician of the last three years. With so many hits to recount, she can firmly say she is on top now. I have always believed she is a ‘laboratory’ musician who was created and not born. By this I mean, she does not possess the natural talent of Juliana, but was moulded into the artiste she is. Of course, this came with her hardwork, tenacity, background as a dancer and the keen eye of her ‘super manager’ Jeff Kiwa. While Sheebah might lack vocally, she measures up to Cindy in as far as powerful performances are concerned. Sheebah has hits for days, months and years. The two artistes side by side would be entertaining, that is for sure, but I think Cindy is a more rounded artiste. Is this battle even necessary? Is it a healthy rivalry or just two females bickering?